We all knew what was coming. Instead of dropping subtle hints in Hunted, Ubisoft dropped boulders. And as you progress through Shadow Heritage, it becomes more and more obvious that nothing you say or do can change the inevitable outcome. The base game has plenty of choice, but the second DLC in Legacy of the First Blade is a stubborn, awkward storyteller, that forcefully shoehorns its poorly conceived plot into your custom timeline. You need to be at least Level 28, though it is recommended you’re at Level 40. I have my theories on why Ubisoft might be heading down this route. The episode ends on a bit of a cliffhanger which foreshadows a rather bleak opening for Bloodlines, and it’s quite possible all of this is happening to be undone at a later point. But the story comes at the expense of its main character. In my case, Kassandra. A Kassandra I’ve spent hours building, molding, and defining over weeks of playtime. A Kassandra who has stayed her hand when a Spartan is prepared to face death. A warrior worshipped as a demigod. In Shadow Heritage, change is forced on us and Kassandra. No matter what she’s done, the story is intent on leading her toward ‘a simpler life’. But you don’t get to choose who you live that life with. You don’t get to determine where you live, or whether to have a child. You don’t even get to choose that child’s name. It all feels completely out of touch with the adventures you’ve been having up to this point. Where choice has played such an important part in each quest, whether it’s a deceitful lie or romantic gesture. The way you approach each task and how outcomes can differ. The supposed love of my life is Natakas. A man I shunned at near enough every opportunity. Never nasty, but responding in typical Kassandra fashion as I have done so many times before. It’s nothing personal as he’s a nice enough guy, but he’s not a particularly well-written character or one I particularly care about. And yet, Kassandra keeps giving him these glances during cutscenes, and when I reject his advances I often see the pained grimace on his face. It gets to a point where the guy just won’t take no for an answer and keeps showing up. It’s exhausting and frankly, all a bit uncomfortable. 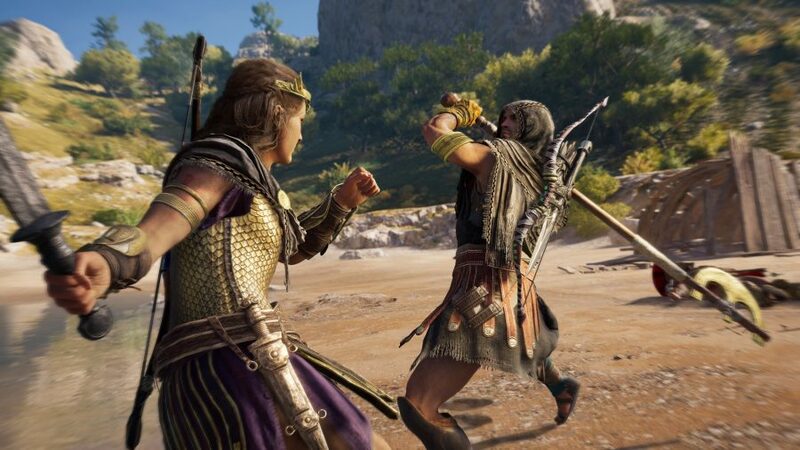 And while Ubisoft clearly have a story they want to tell with Kassandra and Alexios, by giving the player so much responsibility over shaping the world around them, that player connects with the character on a different level than they ever will with a Nathan Drake or an Aloy. Their choices part become that character and, in theory, the world around them will respond in kind. There’s no such opportunity to shape the events in Shadow Heritage in any way. And to be honest, after going through so much with this character, I feel like it would be fair to at least let the player have some sort of input on her future life. As the trophy states, though, Ubisoft are adamant on Kassandra ‘growing up’ and living a life of ‘domestic bliss’. It’s a very narrow-minded view and the abrupt nature of it all is poorly written, and ultimately, overshadows any good the DLC occasionally throws your way. 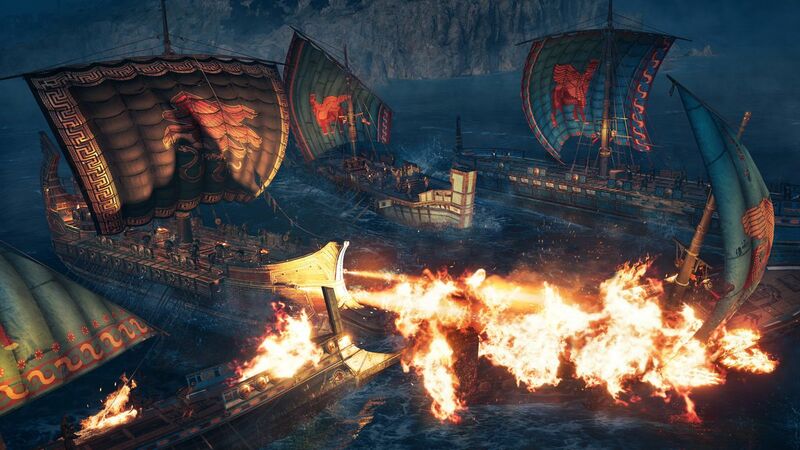 Like, the ship battles, which offer a nice break from the land-based warfare, and the intriguing relationship between Kleta and The Tempest, the DLC’s big bad. Amazingly, there is actually more to Shadow Heritage than the romantic thread which has dominated the headlines. But because it’s so badly done and constantly in your face, it’s all you’ll end up thinking about. Unfortunately, the cutscenes don’t help Shadow Heritage’s case either, as they are often stuttery and juddery. Lines of dialogue end up running over one another, and there’s lag in the midst of fight sequences. The poor performance issues I experienced in Hunted have, amazingly, carried across to this DLC, and somehow got worse. From start to finish, Shadow Heritage is a mess and truthfully, it’s probably best avoided. It’s full of poor directing choices, awful narrative decisions, and glitches that seem to worsen throughout. What it’s building up to is anyone’s guess, but sadly, despite the strong opening of Hunted, I can barely muster the strength to care.